Moan as we might, and do, about the windy, wet spring weather, our troubles are small compared with those facing the Bonneville Power Administration. Last June, an unexpected confluence of high winds and high water almost forced Bonneville to pay for power. Not to buy it. To sell it. There was so much electricity for sale in the Northwest and California nobody needed the surplus megawatts pouring from the region's dams, or spinning off the hillsides. Thermal generating plants - coal, natural gas, even the nuclear Columbia Generation Station - were shut down or operated at minimum possible output. Spokesman Michael Millstein says Bonneville even looked to the Midwest for possible electricity buyers, but could not find a way around transmission system bottlenecks. The result was a big electricity freebie: Bonneville gave away 50,000 megawatt-hours of power. One megawatt can sustain about 700 homes. This year, with the highest runoff in more than a decade projected for the Columbia River, and many more windmills in place, Bonneville - and its public utility customers - could suffer from an excess of fluids. Last Saturday, the region set a new wind generation record: 3,131 megawatts. But in a perfect demonstration of how volatile a resource wind generation can be, output Thursday dropped as low as 34 megawatts. 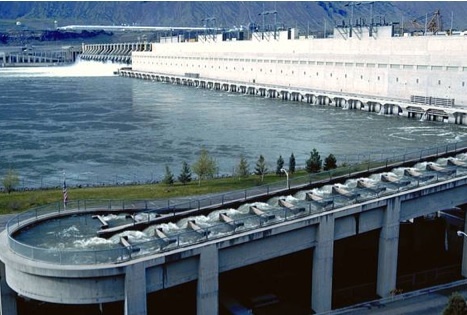 To offset the variations, federal dams on the Columbia and Snake rivers operate about 1,000 megawatts above minimum generating capacity. When the winds come up, dam output can be cut back. That's not possible when the river is brim-full. Even with dams at maximum output, it may be necessary to send some water down spillways. But spilling water creates gas bubbles harmful to fish. To prevent that from happening last June, wind turbine operators were ordered to feather the blades on their machines - in effect turning them off. For developers who use the federal Investment Tax Credit to finance their projects, feathering is no big deal. They are paid whether or not their machines are running. But for those who bank on federal Production Tax Credits and and/or state Renewable Energy Credits, there's real money involved; $21 per megawatt hour on the tax credits, up to $10 per megawatt hour on the energy credits. Caught off-balance last year, Bonneville set about writing rules that will dictate its response to future crises. Its draft "Environmental Redispatch and Negative Pricing Policy" was released in February. For customers of public utilities like Inland Power & Light Co. and Kootenai Electric Cooperative, the upshot is this: Bonneville will not let them absorb the costs of managing an electricity surplus. When all the federal dams are at maximum generation, spilling more water endangers fish, and the transmission grid can export no more power, the agency will invoke a contract clause allowing it to shut out wind generators. The proposal has hit the fan. The region's biggest wind farm operator accuses Bonneville of trying to trample on contracts when they become an inconvenience. Supporters of renewable power say Bonneville is hiding economic self-interest behind the salmon; better to shut down coal plants. Portland General Electric suggests antitrust issues might be raised. Northwest Requirements Utilities - the president is Inland Power & Light Co. Chief Executive Officer Kris Mikkelsen - supports the Bonneville plan because it protects fish, insulates public power customers from unwarranted costs, and maintains system reliability. Millstein says Bonneville could finalize the redispatch plan as soon as this week. "This is going to be an interesting spring," he says.